The sixth series of the rebooted Doctor Who had its ups and downs. The show has always been inconsistent, so this was nothing new, but for his second series as showrunner, Steven Moffat experimented with a number of ideas which, whilst ambitious, often didn't work. The introduction of stronger serialisation concerning the creepy and mysterious order known as The Silence gave an undoubted drive to the show, as well some really quite startling images, it also made the typical structure of the show (a heady mix of standalone episodes and ones which move the greater plot forward) feel more awkward than usual. It didn't help that the series was split in two, so any momentum built up over the mostly excellent first seven seemed to have disappeared by the time the spottier last six aired. It didn't help that the mythology of The Silence, their plan and their relationship to The Doctor, Amy, Rory and River Song became so dense and oblique that it was hard to follow, and therefore care about, what was going on. The show still nailed its character moments, and its knack for balancing often dizzying plots with rapid-fire, witty dialogue was unscathed, but by the time it reached "The Wedding of River Song", half the excitement it generated was from seeing how Moffat would wrap his sprawling master-plot up, and half from knowing that it'd finally be over and the show would be able to move on. When, at the end of that (very good) episode, The Doctor decided that he needed to return to the shadows because he'd become "too big" and garnered too much attention, it seemed like an acknowledgement that the show itself had bitten off a little more than it could chew. Scaling things back might be a better approach. That ethos certainly seemed to be the guiding principle behind "The Doctor, the Widow and the Wardrobe", the 2011 Christmas special which focused on The Doctor helping a family during World War II. It was a pretty slight affair, and not especially good, but it was nice to see an episode of the show that was unabashedly small in its focus. 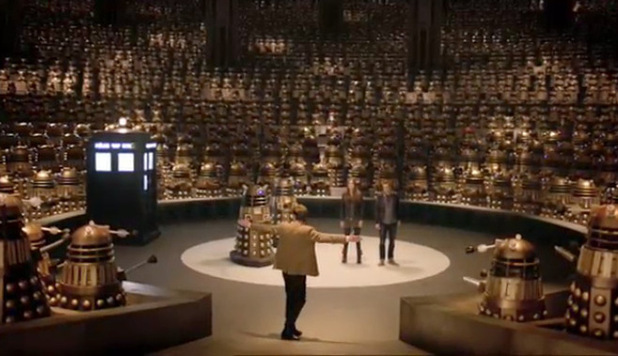 Starting the seventh series by having The Doctor arrive on the scarred, barren world of Skaro, original home of The Daleks, then having him be surrounded by thousands of the motorised pepper pots amongst sets with a grandeur the show has rarely displayed might, in this context, seem like a bit of a regression for the show. After all, we've seen invading Daleks three or four times since Doctor Who came back in 2005, what more could Moffat squeeze out of the concept? Two words: "Save us." Well, that certainly is novel. From the moment that the Daleks revealed that they needed The Doctor to go down to the planet they use as an asylum in order to help them destroy it, the episode turned into a pretty great little excursion packed full of twists, surprises and even a few genuinely creepy moments. Probably the greatest surprise was the introduction of Oswin, played by Jenna-Louise Coleman. For anyone unfamiliar with Coleman, you won't be for long since she is due to become the new companion once Amy and Rory make their exit at the end of this five-episode run. Her presence in the episode was kept under wraps, quite an achievement in our spoiler-addicted age, and it was a delightful introduction. She played Oswin as a Doctor-calibre genius whose inability at baking souffles was inversely proportional to her ability to hack Dalek technology. Her rapid-fire exchanges with The Doctor were one of the highlights of the episode, though if she keeps talking that quickly I imagine the scripts for later episodes will start to get increasingly phone book-like. It does raise the question of how exactly she'll factor into the later episodes, considering this one ended by revealing that she was actually a Dalek who had imagined that she was still human, but if Moffat can keep cramming Amy and Rory into every episode, I'm sure this won't be too much of a problem. Having them be kidnapped along with The Doctor felt like a fairly weak excuse for bringing the old crew back together, as well as a pretty obvious way to start what looks like Amy and Rory's own farewell tour. Whilst I don't begrudge Moffat the chance to say goodbye to his own characters in his own time, it seems like a more clear break with the past would have fit the change in direction for the show, especially since the end of series six seemed like such a natural endpoint for all the old characters. If the next four episodes are as entertaining as "Asylum of the Daleks", this slight awkwardness probably won't matter, but it feels like the show is spinning its wheels until the real changes can begin, and I'm more excited by those than the chance to spend another few weeks with characters who have overstayed their welcome. - Speaking of how much I like Gillan and Darvill, that scene in which they argue over who loves who most was just great. Not merely because it recalled Rory's role as the Centurion, which remains one of my favourite things from Moffat's run, but because it really drew upon the history between the characters. There was something quite raw about it which felt un-Who, but in the best possible way. - Skaro looked very, very cool. The show sometimes shows the limitations of its budget in its depictions of alien worlds, but that was not one of those instances. - Even though the show moved back towards grand and epic this time around, it was interesting that they still worked in elements of rebooting the show, most notably by having Oswin wipe The Doctor from the collective memories of The Daleks. Hopefully this will continue going forward, allowing the show to build new interactions between the characters without being beholden to the established relationships. - Since there doesn't seem to be a big master-plot this year, there doesn't seem to be much room for speculation, but when has that stopped anyone? I reckon that Oswin will be reintroduced in some past version of herself, which might interrupt the natural flow of time and cause all sorts of mischief or, since we only heard her referred to by her surname, Jenna-Louise Coleman could come back to play this Oswin's sister. It worked for Martha Jones, after all.